As indicted at the end of last month’s Quotidian briefing, the most important economic and market-moving news in September was the Federal Reserve’s decision on US interest rates at their mid-month meeting. According to market commentators, downward pressure on equity valuations in August had been aggravated by concerns that the Federal Reserve would increase US interest rates for the first time since 2006 at this month’s meeting. In the event, the Fed decided to leave interest rates unchanged and one would be forgiven for thinking that that was good news. However, the same voices that had predicted the end of the world if rates had been increased now changed their tune and put a profoundly negative spin on the decision to postpone any rate rise. Having gently recovered and moved upwards again in the early weeks of September, the market was hit once more by a tsunami of negativity following the Fed’s announcement. It must mean that the US economy is a lot weaker than the Fed is letting on. The Fed is worried about making the financial and political turmoil in Europe and the Middle East even worse (with potential knock-on effects on the US economy). The Fed doesn’t want to make the US dollar even stronger and thereby make US goods and services even less competitive. As interest rates rise so the cost of repaying debts will rise for the already heavily leveraged governments in Europe and the Far East and the Fed doesn’t want to potentially cause a new and even larger global sovereign-debt crisis. Whilst some of these assertions are no more than guesswork and others may have a degree of merit they are not, in our view, sufficiently persuasive to justify the major equity downgrading that then occurred. Firstly, its role is to maintain the unemployment rate in America at or close to its long-term average of 4.9% (the official unemployment rate in the USA is currently 5.1% having been at nearly 10% as recently as 2012). Secondly, the Fed is responsible for keeping inflation under control (and that is deemed to mean at an annual rate of 2% on average). Inflation in the US is currently lower than that figure and the Fed would like it to increase to their target range. Janet Yellen (the Federal Reserve Chair) is, of course, well aware of the pervasive impact on society generally (and particularly those who are reliant on pensions and savings to generate their income) of over six years of zero interest rates. She would clearly like to make a relatively modest increase in interest rates at this stage of the economic cycle and it is very likely that rates will increase marginally before the end of 2015. Given what has happened over the last six weeks this should now be received as a positive move by the equity markets. One important effect of this long period of low interest rates has been the impact on income generated by pensioners. Many investors (especially the elderly) have been prepared to take a much higher risk profile in their investment strategy in their search for worthwhile returns. This has been and will continue to be another positive for stock-markets. However the latest Chinese economic data issued towards the end of September wasn’t encouraging; new orders are falling, output is falling, employment is falling, and prices are falling. In particular, China’s Purchasing Managers Index sank to a reading of 47 in September from 47.3 in August and now sits at its lowest since March 2009. As a consequence, global equities are continuing to fluctuate wildly in the short term and have contributed to the current air of pessimism. Up until now the Healthcare and Biotech sectors have been areas of the market which have remained buoyant and immune from pricing gyrations. 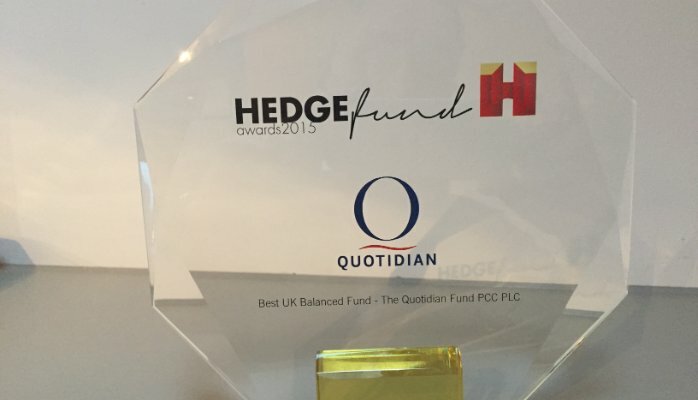 It is no coincidence that the Quotidian Fund has been focused therein. However, in the last week of September even that segment of the market was very aggressively marked down. We saw seven successive days of downward revision of prices in Healthcare and Biotech shares and three of those days were very steeply negative. As a result, we believe that stocks in those sectors are now grossly oversold and we expect a strong rally in the weeks and months ahead. On 30th September the FTSE 100 closed at 6248 (which equates to – 7.68% for 2015 to date). This represents a decline of 2.98% in the hyper-volatile month of September. By comparison the Quotidian Fund at the end of September was + 9.19% for the year to date, having declined 4.90% in the month. Despite this downward revaluation, we remain 16.88% ahead of our benchmark (the FTSE100 index). In October the third-quarter earnings season will be upon us and it will be nice to get back to talking about products (supply and demand), profitability and economic reality instead of political matters. Many analysts have lowered their forecasts for corporate profits and earnings per share. If the reality turns out to exceed these forecasts then it will add another much- needed boost to equity valuations. We therefore believe that the FTSE will end this year significantly higher than its current subdued level and much closer to the 7000 point level it last achieved in April. Similarly, we anticipate that the US market (and especially the Healthcare and Biotech sectors) will move higher from here.